The traditional British Bespoke suits originated in the 19th century from the same place where Ashish & Pawan of Knights & Lords have trained in their craft of making Custom Suits, Savile Row – London, a place where the first Bespoke Tailors set up shop and inevitably gave birth to the Quintessential British Bespoke Clothing. In 1860, King Edward VII was said to have placed a custom suit order with one of Savile Row’s best and the first Bespoke Tailor – Henry Poole & Co. – for a tailless smoking jacket cut from fabric traditionally used for the more formal tailcoat. 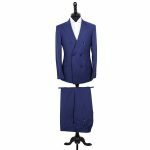 This gave birth to the act of commissioning tailored suits where you could design your own custom suit as per your own specifications and personal preferences. Today this street in central London’s Mayfair, called Savile Row where Ashish & Pawan of Knights & Lords Dubai has trained from, remains the preserve of the highest excellence in bespoke tailoring in the world. While the double-breasted tailored suit is undoubtedly an invention of the British, it is the single breasted suit – with a single row of buttons down the front – that is often referred to as the classic British tailored suit style. Set apart from other forms by its contoured and fitted look, the traditional British Bespoke Suit cut harks back to its origin in the practice of hand-cut custom suits from Savile Row, the spiritual home of bespoke tailors Ashish & Pawan of Knights & Lords. You will notice that a traditional British bespoke suit crafted at Knights & Lords have armholes that are higher for a close-fitting sleeve. The shoulders of our bespoke suits are narrow and defined, while the waist is nipped-in and tapered. British-cut Bespoke suits at Knights & Lords come in two or three-button style, usually positioned high. Bespoke suits crafted by us feature the Drape Cut method of bespoke suit making which appears slimmer without the slightest compromise on comfort by using a cross-cutting technique where the fabric is cut against the grain in a diagonal manner. As per the standards set by the Savile Row Bespoke Association, custom suits crafted by Knights & Lords have its pockets, lapel, and sleeve cut and sewn entirely by hand. Today, bespoke suits crafted by Ashish & Pawan have been lauded for its precision and perfection and have been worn by celebrities, nobles, and heads of state such as King Oyo of Uganda, Mike Tyson and many others. 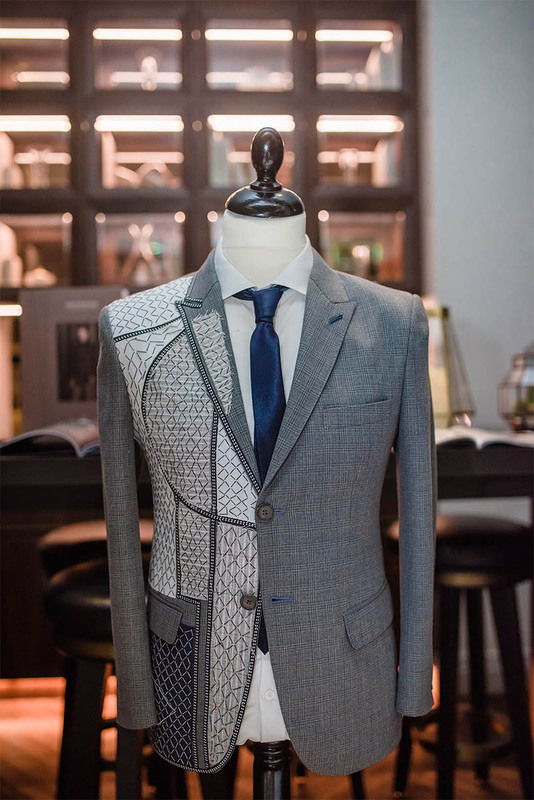 Tailored Suits crafted at Knights & Lords have been acclaimed not just in Dubai but across the world. Think of a Bespoke Suit by Knights & Lords and you shall immediately imagine an impeccably groomed gentleman stepping out of the atelier of Savile Row trained bespoke tailors, Knights & Lords indulging in their own personal practice of pleasure through effortless elegance with a quiet confidence combined with the surety of arriving at their destined door of unknown pleasures. A bespoke suit by Ashish & Pawan at Knights & Lords will thus eventually create a deep shift within your inner dimensions and make you realize who you really are in this vast multi-verse and more importantly who you can be if you wear bespoke clothing meant for who you want to be making you one with the astral projection of your future self-resulting in an illuminated mind and an open Eye of Bespoke.